So far Joerg Weser has created 47 blog entries. 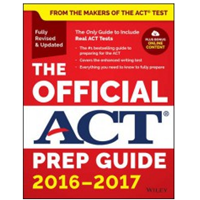 Detailed reports are now available for the official practice tests #1 and #2 from the College Board. The detailed reports are automatically activated if you are using our SYSTEM KEYS. If you are using your own copy of these keys, you can easily deactivate your own keys and activate the SYSTEM KEYS. Just go to the KEYS menu in your OnlineScoreTracker account, select PSAT and then activate/deactivate keys as desired. The categories used for the PSAT mapping are the same as used when mapping SAT keys. For details, please check here. Are you grading practice SAT Subject tests? The OnlineScoreTracker now supports it. 12 answer keys from ‘The Official Study Guide, 2nd Edition” are already in our database. Please contact us to have this test type enabled for your account. There is no charge for having this test type enabled. You will be charged CREDITS for grading just as with any other of our supported test types. 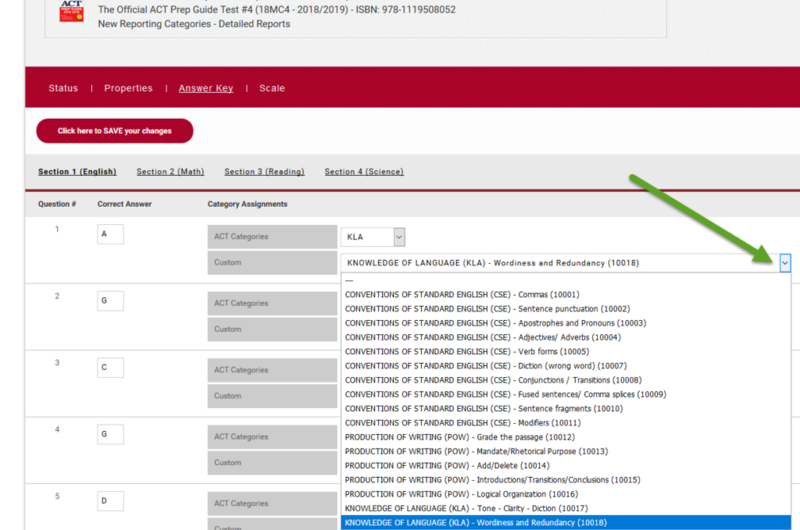 A detailed report for Test #4 in the Official ACT Prep Guide 2018-2019 is now available in your OnlineScoreTracker account. The test is listed as 18MC4 and is identical to the test ACT administered June 2017 (74C). Detailed reports provide additional insights in how a student performs within a given ‘question category’. The OnlineLineScore tracker system allows all tutoring companies to create their own list of unique question categories and then map each test question to one of these question categories. For those who don’t want to take the time to map their practice tests, we have created a comprehensive category list and mapped out the most popular tests. 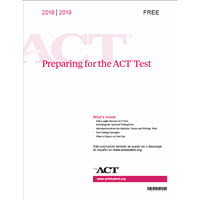 Test #4 of the Official ACT Prep Guide 2018-2019 is now part of that. To use this new answer key, go to KEYS – ACT – and then activate key #69. If you prefer to create your own category map for this key, then don’t activate our system key. 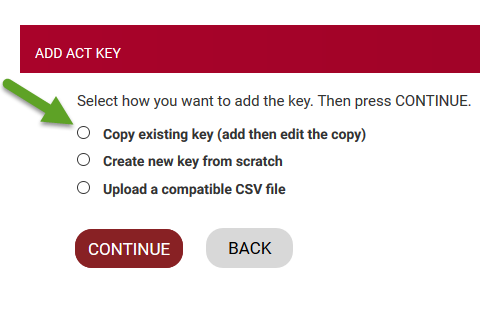 Instead, you may ADD a new key and select to create a copy of our system key. If you would like to review our list of question categories to see if they would work for you, click here. System keys with ‘detailed reports’ will use these question categories. Once you create your own copy from one of our system keys, however, this mapping is invalidated by your own list of custom question categories. If you are interested in installing our (system) list into your OnlineScoreTracker account, you may download the pre-formatted list here.you may download the pre-formatted list here. If you have keys you have questions or would like to have us add to our database, please contact us. We added a new feature to OnlineScoreTracker. 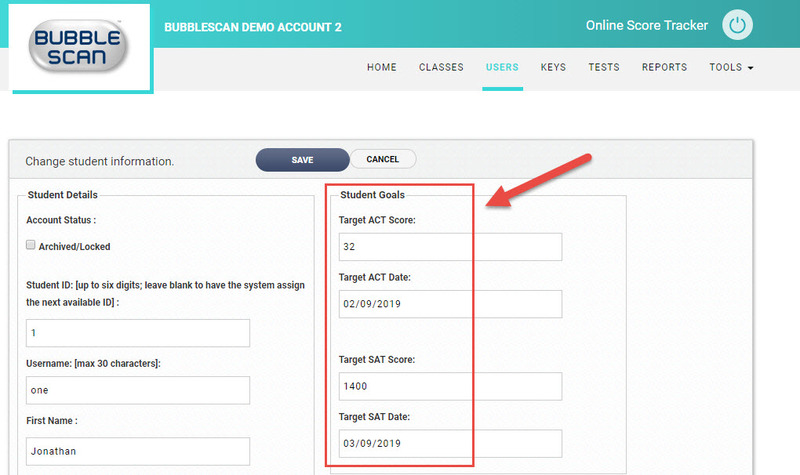 Admins and students can now set goals for ACT and SAT scores and a target date for when that goal should be accomplished. Through Tools-Preferences-Web Panel – Student Portal the admin can select to show the goals tile on the student portal. 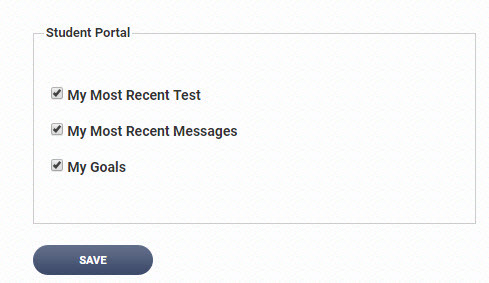 The student will now see his/her goals every time they log into their student panel. This new feature is available to all customers using our credits-based billing. If you are one of the few holdouts that would like to switch – please contact us. Since the last blog entry (back in February) we’ve released several new keys for both ACT and SAT. We appreciate you, our customers, who share these keys with us so we can update our database very soon after new keys become available. THANK YOU. 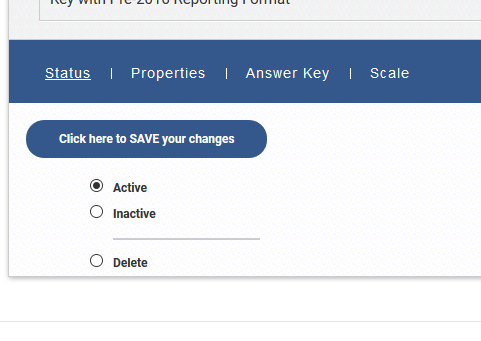 All new keys are accessible as system keys through your admin panel in OnlineScoreTracker.com. By default new system keys are inactive. To activate a key, click the pencil icon in the EDIT column, change the status to Active and then click SAVE. The most recent addition is the key for CollegeBoard’s SAT from Apr 2018. We’ve also tweaked various parts of the User Interface usually associated by a functional change. Most notably was a change to the Student List. You can now select students across multiple screens/searches. E.g. search for Jane Doe, select her; then search for Jonathan Smitty, select him. 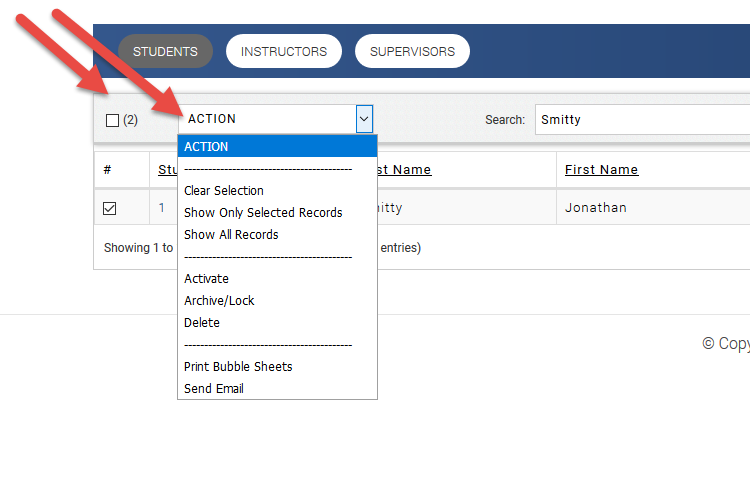 You now have 2 students selected and you can print bubble sheets for those two. The little counter next to the ‘select all’ box at the top of the list shows you how many students are selected. A selection is easily cleared through the ACTION dropdown box. Aside from ACT and SAT/PSAT, all account holders can now also grade tests for SSAT, ISEE, HPST, LSAT. Our generic Test Form 105 is also available at no extra charge. 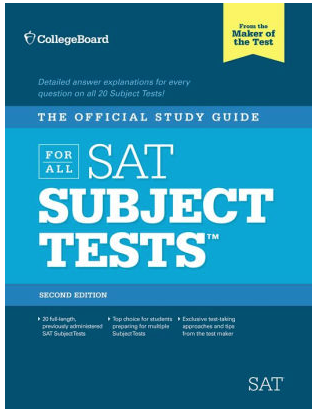 Coming in the next weeks is support for Subject SAT. Thank you for your continue business. 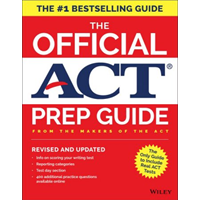 The newer version of The Official ACT Prep Guide (ISBN 1119386896) is slightly different from The Official ACT Prep Guide (2016/2017) ( ISBN 1119225418). The difference is in practice test #1, Math, Question 59. The questions are both dealing with Triangles, but they are different and so is the correct answer. Please check which version of the test your students are taking and use the correct key ID to correctly grade those tests. When grading Test #1 from the current version of the red book use key/test ID 62. When grading Test #1 from the old (2016/2017) version of the red book, use key/test ID 33. All keys are accessible as system keys through your admin panel in OnlineScoreTracker.com. By default new system keys are inactive. Just click on the ‘inactive’ status to toggle it to ‘active’. Online tests can now be administered as timed tests with predetermined breaks. If you have specified a Test Download PDF, the student will see the specified link and a 30 second count-down timer. 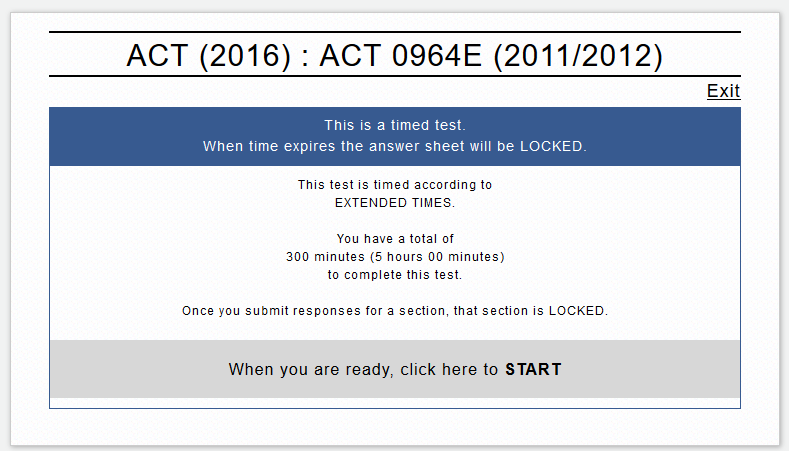 After 30 seconds the online answer sheet will be displayed. 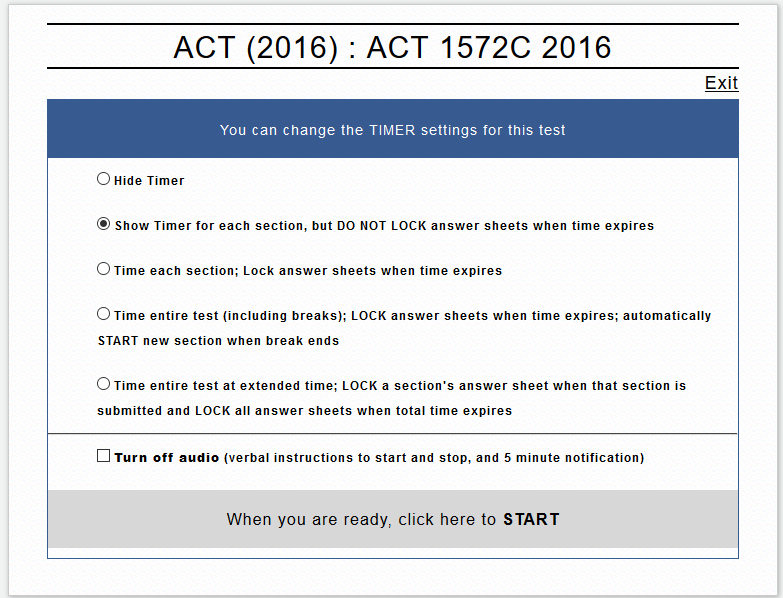 If you did not specify a Test Download PDF, the student will immediately see the online answer sheet and the official timer starts. The student will not have the ability to submit each individual section. 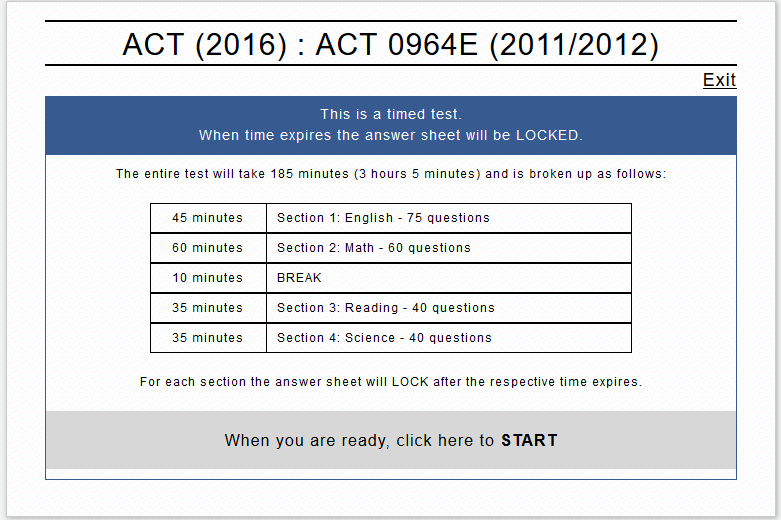 Instead when the time for the active section expires, the answer sheet will lock, responses for the now locked section are automatically transmitted for grading, and the next section or specified break will start. There is a minimum 30 second count-down timer between each section. The student will submit each section when completed. Once submitted the section can not be edited again. The timer will stop after the specified time. At that time all remaining sections are locked. If audio is not turned off, the student will hear verbal instructions to ‘open the book and begin’, that ‘there are 5 minutes remaining’ and to ‘stop working on the test’. These instructions are given for all timed tests (by section, entire, extended time). Any selections the student makes will override settings made by the admin and will remain in force until the entire test is taken.